The only requirement for reporting is identifying a data source. Beyond that, the structure of a report request is very flexible and you only need to include the report elements you want. For example, you only need to include sorting instructions if you want your report to be sorted, or selection criteria if you want to report on a subset of your data. The following are the most frequently used options for structuring a report request. Specifying fields and columns. Each column in your report represents a field. You can specify which fields you want to display, which fields you want to use to sort the report, which fields you want to use to select records, and which data source fields you want to use in creating temporary fields. Therefore, specifying the fields you want in a report is fundamentally tied to how you want to use those fields in your report. Displaying data. You can display data in your report by listing all the records for a field (detailed presentation), or by totaling the records for a field (summary presentation). You can also perform calculations and other operations on fields, such as finding the highest value of a field or calculating the average sum of squares of all the values of a field, and present the results of the operation in your report. Sorting a report column. Sorting a report enables you to organize column information. Developer Studio displays the sort field, which is the field that controls the sorting order, at the left of the report if you are sorting vertically, or at the top, if you are sorting horizontally. Sort fields appear when their values change. You can also choose not to display sort fields. You can sort information vertically, down a column, or horizontally, across a row. You can also combine vertical sorting and horizontal sorting to create a simple matrix. Selecting records. When you generate a report, you may not want to include every record. Selecting records enables you to define a subset of the data source based on your criteria and then report on that subset. Your selection criteria can be as simple or complex as you wish. Showing subtotals and totals. You can display column and row totals, grand totals, and section subtotals in your report. Give column titles more meaningful names. Control the display of columns in your report. Create headings and footings for different levels of the report (including each sort group, each page, and the entire report), and dynamically control the display of headings and footings based on conditions you set. Add fonts, colors, grids, and images. Highlight a group of related information and separate it from other groups by inserting blank lines, underlines, and page breaks. Creating temporary fields. When you create a report, you are not limited to the fields that already exist in the data source. You can create temporary fields, deriving their values from real data source fields, and include them in your report. For details see, Creating Temporary Fields. Joining data sources. You can join two or more data sources to create a larger integrated data structure from which you can report in a single request. For details, see Joining Data Sources in the Creating Reports With WebFOCUS Language manual. Storing and reusing the results. You can store your report data as a data source against which you can make additional queries. This is especially helpful for creating a subset of your data source and for generating two-step reports. You can also format the new data source for use by other data processing tools, such as spreadsheets and word processors. For details, see Saving and Reusing Report Output in the Creating Reports With WebFOCUS Language manual. You can run the request as an ad hoc query or save it as a procedure. Saving a report request as a procedure enables you to run or edit it at any time. When working with WebFOCUS GUI tools that access directories and files from a UNIX system, the WebFOCUS Reporting Server returns lowercase directory names and files, by default. The WebFOCUS GUI tools also create directories and files in lowercase, regardless of the text case specified (for example, lowercase, uppercase, or mixed-case). If the user creates directories or files at the UNIX command level, they must create them in lowercase. A report request begins with the designation of a data source. You can then specify the details of your report request. A report request can use a Master File that is stored in the application directory or in the WebFOCUS Reporting Server APP PATH or baseapp directory. 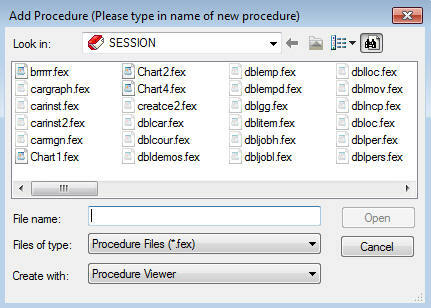 With the Procedures folder highlighted, select New from the File menu. Right-click the Procedures folder and select New from the pop-up menu, then select Procedure. The following image shows the Add Procedure dialog box that opens. Enter a name for the new procedure in the File name field. Procedure Viewer opens the Component Connector toolbox. Report Painter enables you to create complex styled reports. Composer enables you to design reports, and to coordinate and distribute layouts made up of multiple reports and graphs in a single output file. SQL Report Wizard assists you with SQL passthru which allows you to execute SQL code that retrieves data from an RDBMS. You can use the resulting extract file in Report Painter or InfoAssist. InfoAssist enables you to create a chart using an easy to use graphical tool. Text Editor enables you to create a procedure with code. Define Function enables you to create virtual fields. If you select Report Painter, Composer, or Text Editor, the selected tool opens. Click a component connector (yellow diamond) at the point where you want to include the report in the procedure, then click the Report button on the component connector toolbar. Select the Master File you want to report against. The tool you selected opens. The example in this topic is a simple report request that illustrates some of the basic functions of Developer Studio. However, there are many more functions not shown here that you can find information on throughout this documentation. The following annotated example illustrates some of the basic functions of Developer Studio. The numbered explanation in this example corresponds with the code in this request. This request can be generated using Developer Studio graphical tools, or by typing the commands into a text editor. The JOIN command joins the EMPDATA and TRAINING data sources, allowing the request to access information from both data sources as if it were a single structure. The DEFINE command creates a virtual field which extracts the year from the COURSESTART field in the TRAINING data source. The END command ends the DEFINE command. The TABLE command begins the report request. The HEADING command adds the heading, Education Cost vs. Salary to the report output. The SUM command adds the values within both the EXPENSES field and the SALARY field. The AS phrase changes the name of the column headings. The COMPUTE command creates a calculated value using the values that have been aggregated in the SUM command and sorted with the BY command. The BY phrase sorts the data in the report by the DIV field, and then by the DEPT field. The WHERE command includes only the data that falls in the year 1991. The ON TABLE SUMMARIZE command adds all values in both the EXPENSES and SALARY columns, and recalculates the Percent column. The StyleSheet information formats the report heading and content. The END command ends the report request. When you exit a reporting tool, you are prompted to save the report you have created. For details, see Report Painter Basics in the Creating Reports With Report Painter manual for additional save options available in that tool. When you save a procedure created in Report Painter or the Component Connector toolbox, the entire procedure is saved, not only the report component. Close the reporting tool and choose Yes to save the changes. Select Save from the File menu. Your report is saved as a component in the procedure in which it was created. If you add other components to a procedure or edit the report component, you will be prompted to update the procedure (FOCEXEC). Click Yes to save your changes.